Narendra Modi has got his first challenge from his own party. Yashwant Sinha, who owns the image of the BJP and financial minister in the Vajpayee Cabinet, is now looking forward to what he said Ram Ram to BJP is going to do with political leaders across the country. Analysts reveal Modi's Charisma Maskabaretan's views on the demagogues of the MPs in their own party. It is also a reason to resign Yashwant from the Party. Yashwant Sinha, 80, has joined hands with the opposition, saying that he was angry at his indifference to the country's unhappy nationalism. While RJD and Congress leaders align themselves with his party's resignation, it will lead to a new debate. Yashwant is accused of criticizing the Modi-Sarkar-led economy. 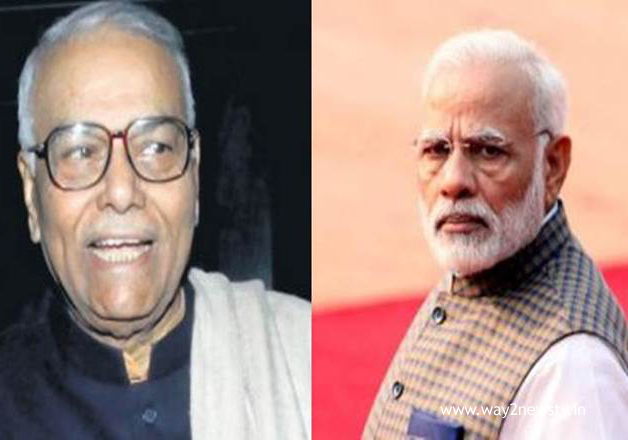 Yashwant alleges that Modi was not in the middle of the session of the original parliament. Yashwant argues that it is not good to continue this catarrh, which is to mislead the democracy of the country and, on the other, democracy. He has also joined Bollywood shotgun, Shatrughan Sinha. The Yashwant Vidyalayam report says that there are already 8 people in their own party against Modi. Yashwant is the first against the party's own decision to abolish the notes of Modi Sarkar. Even after that, Sinha expressed his opinion in a straightforward way. Yashwant's son Jaswant Jayant Sinha was not in the Modi Cabinet while he did not expect to be aggressive. Even though the criticisms of the government were criticized, they all thought they were only temporary. How should Modi find Sarkar faced with the challenges of his resignation?